September 12, 2013: Eleven brands join discussions on compensation to victims of Bangladesh factory disasters. Other key brands turn their back on workers’ plight. Some advance payments agreed. Eleven of the brands and retailers sourcing from the factories involved in the Tazreen and Rana Plaza disasters joined high-level compensation meetings, facilitated by the ILO as a neutral chair, on 11-12 September in Geneva. Many other major companies failed to attend, showing total contempt for the 1,900 workers who were injured and the families of over 1,200 workers who were killed making their products. Regarding Rana Plaza out of a total of 29 brands that were invited the following 9 brands showed good faith by attending the meeting: Bon Marché, Camaieu, El Corte Ingles, Kik, Loblaw, Mascot, Matalan, Primark and Store Twenty One. 20 other companies, all of whom were invited, failed to show up: Adler, Auchan, Benetton, C&A, Carrefour, Cato Corp, The Children’s Place, Dressbarn, Essenza, FTA International, Gueldenpfennig, Iconix Brand, Inditex, JC Penney, Kids Fashion Group, LPP, Mango, Manifattura Corona, NKD, Premier Clothing, PWT Group, Texman and Walmart. IndustriALL, the Clean Clothes Campaign (CCC) and the Workers Rights Consortium (WRC) presented a proposed model for compensation, which has been used by brands and retailers in previous factory disasters in Bangladesh. The model includes payment for pain and suffering and loss of income. 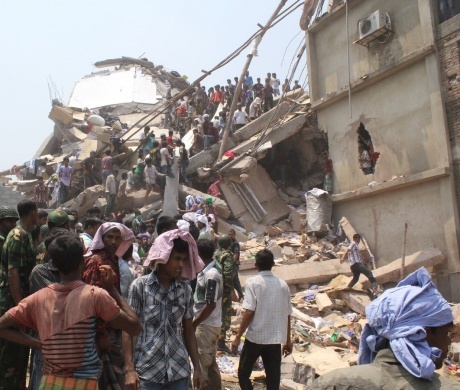 For Rana Plaza US$74,571,101 would be needed to provide full compensation to all workers, of which the brands are being asked to contribute US$33,556,996. For Tazreen US$6,442,000 is required, with US$2,899,000 being asked from the brands. International experts outlined best practices for the establishment of a compensation fund, overseen by a multi stakeholder committee, which could be created through an agreement by all the parties involved. No such agreement was reached at this meeting, although the brands present committed to continuing discussions on this issue. IndustriALL, CCC and the WRC would welcome the creation of such a fund and urge all parties to work together to ensure this is set up at the earliest possible date. The Bangladesh Permanent Representative to the United Nations in Geneva, Md. Abdul Hannan also addressed the meeting. Meeting again within the next two weeks to share information and tools, exchange views, and consider next steps. To contribute financially to a fund to assist injured workers and victims’ families, and commit to move the process of establishing the fund forward quickly. A coordination committee was created to take the process forward through a multi-stakeholder forum which would be open to the Bangladesh government and employers, together with the brands and retailers, unions and NGOs. Commitment to coordinated work going forward, building on initial assistance U.K. retailer Primark has already provided to victims. Primark made available their local banking infrastructure in Bangladesh to deliver any funds that are made available on an emergency basis. Immediately after the meeting Primark committed to providing a further three months salary to all affected families as emergency relief. Unfortunately, none of the other brands or retailers present at the meeting committed to provide such emergency relief. At the Tazreen compensation meeting on the previous day, C&A tabled its substantial compensation initiative for the victims and demonstrated its continued commitment to finding a definitive solution. Karl Rieker, which was also in attendance also signaled a readiness to contribute and was commended for positive participation in the Tazreen discussion. Of the brands and retailers invited to the Tazreen process the following companies failed to participate in the 11 September meeting: Delta Apparel, Dickies, Disney, El Corte Inglés, Edinburgh Woolen Mill, Kik, Li & Fung, Piazza Italia, Sean John, Sears, Teddy Smith, and Walmart. “The disregard of the absent brands for the plight of workers in Bangladesh whose lives have been destroyed by the avoidable accidents at Tazreen and Rana Plaza is shocking in the extreme. Empty promises and direct untruths since the Tazreen fire and the Rana Plaza collapse all so that these Western multinationals can avoid making payments that amount to a minute percentage of turnover. 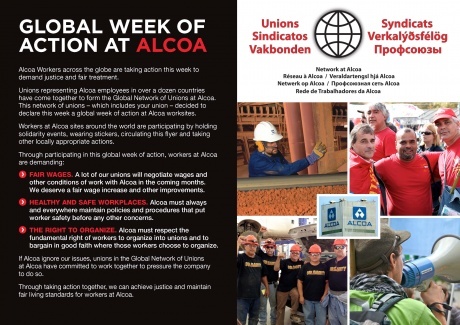 September 11, 2013: IndustriALL-affiliated unions at Alcoa are preparing to hold coordinated actions around the globe next week. They will demand fair wages, high health and safety standards and respect workers’ fundamental right to organize into unions. 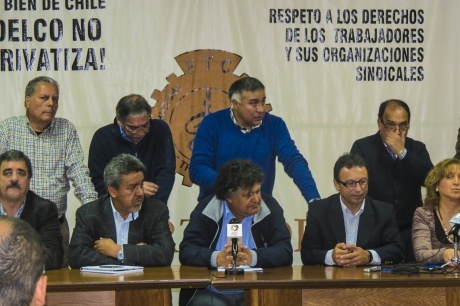 September 12, 2013: The Copper Workers’ Federation (FTC), affiliated to IndustriALL, has given its full backing to workers at the El Salvador Division of CODELCO Chile, who are on a legal strike to safeguard the division’s future. The strike began on the first shift of 5 September and involves 1,122 members of unions N°2 (Potrerillos) and N°6 (Salvador), both part of CODELCO’s El Salvador Division. Unions were unable to reach agreement with the state-owned mining company through the normal process of collective bargaining. The FTC issued a statement to the general public and its members declaring its support for “the sovereign decision by workers at the El Salvador Division to start a legal strike in order to ensure the government invests enough to make this important mining and metalworking operation viable in the medium and long term while also ensuring respect and decent conditions for the workers who strive every day to achieve this objective for the country”. The FTC also criticised company management “for not having the capacity to listen and reach an agreement that is satisfactory to both sides”. The FTC said “that it has always been and will remain available to help find a balanced and fair solution to this dispute in a framework of dialogue, mutual respect and understanding, for the good of the future of the division and its workers, who are the main asset of this company, which is owned by all Chileans”. Regarding the government’s decision to invest only US$ 1,000 million in CODELCO in 2013, the FTC said that on 10 September “the National Executive Committee filed a claim for the Supreme Decree issued by the Finance Ministry to be declared legally invalid “as it constitutes an infringement of Decree Law 1.350 of 1976, which created the National Copper Corporation of Chile (CODECLO)”. said Horacio Fuentes of the national metalworkers’ confederation, CONSTRAMET. September 12, 2013: As strikes in the gold sector and auto sector come to an end, workers in motor sector start strike action for better wages in a heated bargaining season for South Africa. Employers in the Gold sector rapidly came to the negotiating table with an improved offer, after the National Union of Mineworkers mobilised 80,000 gold miners on a strike action starting 3 September after wage talks reached a deadlock. The strike ended within days with agreements reached on a company by company basis and formalised in a signing ceremony at the Chamber of Mines on 10 September. Gold mining workers agreed to a settlement of 8 per cent increase for the lowest paid workers and 7.5 per cent for the rest. Inflation linked increases were also agreed to for 2014. Workers will also receive Euro 15 a month increase on their living out allowances in the first year which will be increased by a further Euro 15 in the second. 30,000 auto sector workers organised by the National Union of Metalworkers of South Africa ended the strike after employers including BMW, Toyota and VW revised their offer from 7 per cent to 11.5 per cent. The strike that started on 19 August went on for three weeks as workers refused the 10 per cent offer brought to them during the strike, sending Numsa back to the negotiation table. Numsa also agreed to a 10 per cent increase for auto workers in the second year and again in the third year as well as a Euro 100 transport allowance a year, a Euro 62 monthly housing allowance and 70 per cent contribution to medical aid by employers. As one strike came to an end, another began for Numsa, this time in the motor sector as 70,000 workers have downed tools on 9 September, after a deadlock in negotiations with employer bodies the Retail Motor Industry and the Fuel Retailers’ Association. Workers have rejected a 7 per cent wage offer and are demanding a double digit salary increase and an improvement of afternoon shift and night shift allowance. Whilst employers have complained about the cost of the strikes to companies and the economy, South African workers and their unions have found it necessary to put up a fight for better wages in the face of increasing cost of living and have come out victorious. 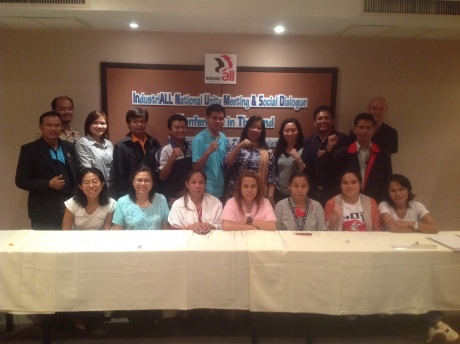 September 10, 2013: Since the formation of IndustriALL Global Union, IndustriALL affiliates in Thailand have jointly started a series of discussions to strengthen the Thai union movement, in an effort to unite the Thai labour movement and fight precarious work in all its forms. At the Unity Meeting held on 7-8 September in Bangkok, union representatives from the Confederation of Thai Electronic, Electrical Appliances, Auto and MetalWorkers (TEAM), the Textile, Garment and Leather Workers Federation of Thailand (TWFT), the Electricity Generating Authority of Thailand Labour Union (EGAT LU), PTT Labour Union (PTT LU), the Chemical Workers Union Alliance (CWUA), the Paper and Printing Unions Federation of Thailand (PPFT) and the Petroleum and Chemical Unions Federation of Thailand (PCFT) expressed their commitment to work together. A key strategy has been the work towards setting up the new Confederation of Industrial Labour of Thailand (CILT), which will bring together TEAM, the Automobile Labour Congress of Thailand (ALCT), TWFT and the unions that earlier formed the ICEM Thai Council i.e. EGAT LU, PTT LU, PPFT and CWUA. said Chalee Loysoong, president of TEAM. CILT will represent at least 153,000 workers in the electronic and electrical appliances, auto, steel, chemical, rubber, materials, paper, textile, garment, leather, oil, gas and electricity in Thailand. These industries employ millions of Thai and migrant workers from, among other, Myanmar, Cambodia and Laos. Thailand is the second largest economy in Southeast Asia, with a workforce of 40 million. It receives a lot of foreign investment, including from major multinational companies from OECD countries. At the same time, Thailand has a very poor record on trade union rights and, often as a result of that, very few workers belong to trade unions. For the day of action to STOP Precarious Work on 7 October, IndustriALL affiliates in Thailand take to the streets of Bangkok to campaign for the ratification of ILO Core Labour Rights, Convention 87 and 98. They will also formally announce the creation of CILT on that day.